In a recent report, the U.K.-based charity World Animal Protection (WAP) identified Turkish Airlines as one of the main airlines enabling the illegal trade in African grey parrots. Calling the carrier the “poacher’s airline of choice,” the report published Feb. 4 noted that smugglers were using Turkish Airlines to illegally move a large number of African grey parrots on flights from the Democratic Republic of Congo to countries in the Middle East and western and southern Asia. In response, Turkish Airlines on Feb. 13 issued a global embargo on the transportation of African grey parrots on any of its planes, according to a press release from WAP. Wildlife traffickers rely heavily on airlines to smuggle endangered species. Now, in a recent report, the U.K.-based charity World Animal Protection (WAP) has named Turkish Airlines as one of the main airlines enabling the illegal trade in African grey parrots, one of the most trafficked birds in the world. WAP also started an online campaign, “Wildlife. Not pets.”, demanding that Turkish Airlines stop transporting all birds “until it’s sure African grey parrots and other protected species aren’t being flown on its planes.” In response, Turkish Airlines on Feb. 13 issued a global embargo on the transportation of African grey parrots on any of its planes, according to a press release by WAP. 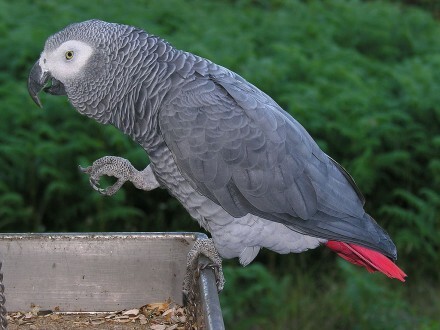 African grey parrots, which include two endangered species, the grey parrot (Psittacus erithacus) and Timneh parrot (P. timneh), are extremely popular in the international pet trade. Famed for their mimicry, the parrots are one of the world’s most illegally trafficked birds, and their capture from the wild has led to catastrophic population declines across their range. In 2016, the grey parrots were included in Appendix I of the Convention on International Trade in Endangered Species of Wild Fauna and Flora (CITES), which means that all international commercial trade in wild-caught African grey parrots is prohibited. Calling Turkish Airlines the “poacher’s airline of choice,” the WAP report published Feb. 4 (pdf) noted that smugglers were using the airlines to illegally move a large number of African grey parrots on flights from the Democratic Republic of Congo to countries in the Middle East and western and southern Asia. Turkish Airlines is a signatory to the Buckingham Palace Declaration, an agreement that commits to take steps to shut down the routes exploited by illegal wildlife traders. But the airlines hadn’t taken any real action to curb the trafficking in grey parrots, the report said. 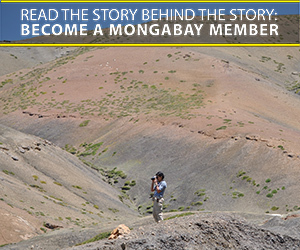 Turkish Airlines did not respond to emailed questions from Mongabay. The international pet trade is slashing African grey parrot populations in the wild. Image by L. Miguel Bugallo Sánchez via Wikimedia Commons (CC BY-SA 3.0). Sharma said Turkish Airlines was just one of “a number of airlines” mentioned by sources during WAP’s investigation. 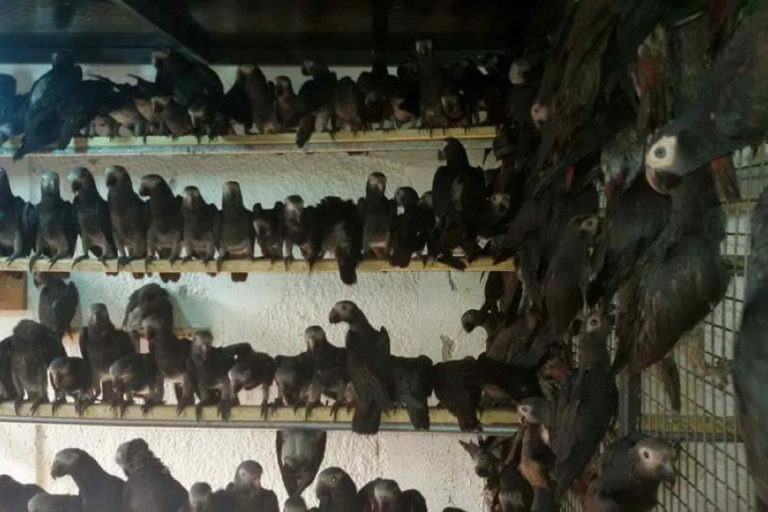 To smuggle African grey parrots on flights, traffickers prefer direct flights from the source country, like the DRC, to the destination, Sharma said. This is “often provided by larger rather than regional airlines,” which are preferred “as they involve fewer transit stops, and [have] less chance of being discovered by customs,” he said. Grey parrots are also mixed in with other legally traded green birds in crates, Sharma added, with a green mesh placed over the crates so that the birds are hard to identify for customs officials. Many grey parrots don’t make it to the end of the journey. Stuffed in crates, unable to move or breathe, they are known to frequently starve or succumb to stress or disease. African grey parrots during transportation. Image by anonymous.